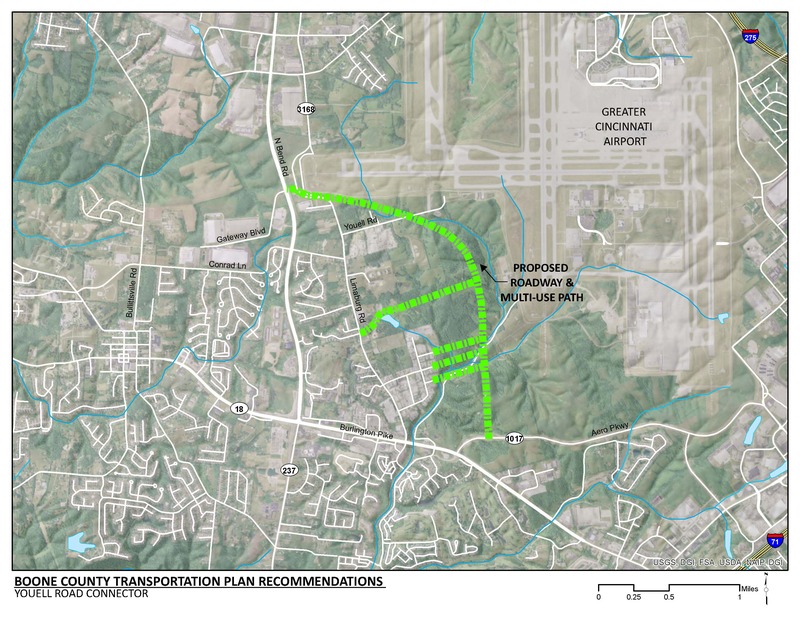 Construct a new, five lane roadway to connect KY 1017 (Aero Parkway) and KY 237 (North Bend Road) south of the Cincinnati/Northern Kentucky International Airport (CVG) to assist in accommodating future, planned industrial development on KY 1017. Install a multi-use path along the roadway. Connect the new Youell Road Connector to Limaburg Road. Consider extending Distribution Drive and Production Drive to complete connections to the new roadway. The Youell Road Connector will provide a new route along the southwest side of the airport. The new route will improve east-west mobility for vehicular, truck, bicycle and pedestrian traffic, and reduce traffic volumes on KY 18 (Burlington Pike) and Limaburg Road. The proposed multi-use path along the Youell Road connector is a piece of the proposed CVG Loop Trail. This recommendation is consistent with Boone County’s overall goal of improving bicycle and pedestrian connectivity and safety. Click HERE for a map of multi-use paths in Boone County. Gunpowder Creek runs through properties located southwest of CVG. Depending on the preferred alignment chose for the Youell Road Connector, one or multiple crossings of the creek will be necessary. There are a few hazardous material sites within the vicinity of the project that may be impacted. KY 18 and Limaburg Road provide current roadway connections between KY 1017 and KY 237. KY 18 is currently congested and traffic from planned industrial- and distribution-related development in and around CVG is expected to increase volumes and delay on the surrounding roadway network. Land uses in the project vicinity are primarily industrial, commercial, and residential. The 2040 land use map shows an expansion of industrial land use through the project area. By year 2040, employment in the area adjacent to the proposed roadway is expected to grow by approximately 600 jobs. TANK route 32x runs along KY 18 from Burlington to downtown Cincinnati. This route serves a Park & Ride facility in the Kroger shopping plaza between KY 237 and KY 1017. There is an existing multi-use path along KY 1017 and proposed multi-use paths for KY 237 and KY 18. These multi-use paths comprise portions of the CVG Loop Trail network.